Perhaps it is the joy Bl. Reginald felt in putting on the habit of the Order of Preachers that makes us love him so much nearly 800 years after his death. Or perhaps, everyone likes to receive new clothes and in Reginald receiving the habit from Our Lady we rejoice knowing that we too are "clothed in the garments of salvation". Whatever the reason, Bl. Reginald, whose feast we celebrate today, remains one of the most beloved of the early saints of the Order. His life captures our imagination and exemplifies the fervor of those first days of the Order. Reginald was born in 1183 in Orleans, France. He studied canon law at the University of Paris. He was brilliant but he was also holy and was made Dean of the Cathedral Chapter at Orleans. He also had a great love for Our Lady. A trip to the Holy Land became the occasion to stop in Rome. 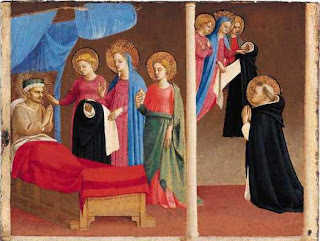 Here he was introduced to St. Dominic and St. Dominic knew that in Reginald he had found someone not after his own heart but after the heart of Christ. Reginald on his part was taken by St. Dominic and found in him and his newly-founded Order of Preachers everything his zealous heart desired! Shortly after, Reginald became deathly ill. We are told that as he lay dying, Reginald was visited by our Lady who was also accompanied by St.Catherine of Alexandria and St. Cecilia. Later, he told the brethren that the Mother of Mercy anointed his body saying, “I anoint your feet with holy oil to make them ready to spread the gospel of peace." She then gave him the habit of the Order. Exactly what this means is debated by historians but the tradition is that he was given the scapular which to this day is the only part of the habit that is blessed and has always been considered the habit. We do know that about this time St. Dominic and the brethren stopped wearing the surplice which was worn by the Canons and instead wore the scapular. His health restored, Master Reginald fulfilled his desire to go overseas, although he was already bound to the Order by profession. On his return, he went to Bologna, which he reached on December 21, and at once he threw himself utterly into preaching. His fervent eloquence fired the hearts of all who heard it as if it had been a blazing torch; hardly anyone was rock-like enough to be proof against its heat. The whole of Bologna was in ferment; a new Elijah seemed to have arisen among them. During this period he received many people into the Order in Bologna, and the number of the disciples began to grow, as more and more were added to them. Brother Reginald, of holy memory, came to Paris and preached Christ Jesus and him crucified. But God soon took him from the earth. Finishing his course in a short time, he had accomplished a full life’s work. Zeal for the salvation of souls, all the writers assure us, simply consumed the holy man. Enormous numbers flocked to his sermons. Vocations to the Order increased. Many came from among the students at the university. But such labors and mortification were too much for his strength. His health began to fail, and kindly Matthew of France ventured to warn him that he should be more moderate. Yet, as no positive order was given, the relaxation was not sufficient. Possibly Matthew afterwards intervened more sternly. However, it was too late. The fire of life had burned out, and Reginald surrendered his pure soul to God in the first days of February, 1220. In his death the Friars Preacher nearly everywhere mourned the loss of one whom they considered, next to its founder, the strongest support of their new Order.